Improvised comedy is bound to be a hit-or-miss affair sometimes; so is scripted theater, when it comes right down to it. I’ve been consistently impressed with the efforts of San Francisco’s Un-Scripted Theatre Company, which manages to improvise a different full-length play every night, often to hilarious effect. I’ve seen them do holiday musicals, Bollywood-style musicals with puppets and musicals in the style of your favorite playwright. Their last show, Secret Identity Crisis, was a terrific superhero send-up. Other shows I missed included improvised Shakespeare and plays in the genre of your choice in Dickensian style. Inevitably some nights and some shows are better than others, but their batting average with the stuff they make up on the shop has been as good as or better than a lot of the small fully-scripted companies I follow. 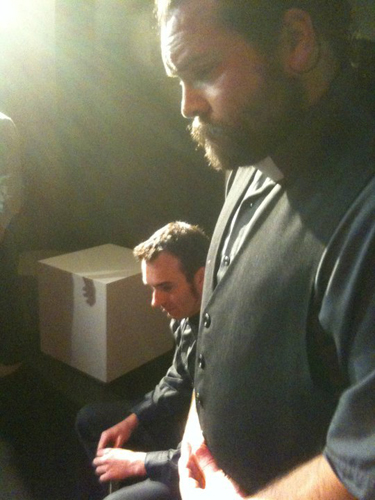 Steven Westdahl and Christian Utzman in Act One, Scene Two (Jigsaw, July 15). Photo by Clay Robeson. Directed by Mandy Khoshnevisan, the latest show, Act One, Scene Two, delves into uncharted territory for Un-Scripted Theater—scripted theater! Well, partly scripted anyway. Local playwrights were asked to contribute the first scene of an unfinished play, and the company makes up the rest. Only literary manager Alan Goy has read all the scripts beforehand and made some notes about which characters shouldn’t be played by the same person because they’re going to have to interact later on, and that sort of thing. The actors are allowed to read the scene just before the show starts, while the audience takes its seats, and the performance begins with a short Q&A with the playwright—not so much about particular plot points as general themes in his or her work. Then the actors plunge right in, performing the first scene scripts-in-hand and carrying on seamlessly from wherever it leaves off. I caught the last preview of the show before its official opening. The playwright was Annette Roman, and her play had the unpromising title After the What the…!? Later contributions would be from such local writers as Lauren Yee, Daniel Heath, Garrett Groenveld and Tim Bauer. Roman’s script starts with a fundamentalist Christian family waiting for a Rapture that’s supposed to happen that night but is already overdue. They’ve banked everything on the Rapture, spending all their savings on billboards announcing it. They think maybe they just miscalculated the date, but then their pastor comes calling to say that although they haven’t been called up, the teenage daughter’s atheist boyfriend, the mom’s transgender sister and the old Muslim couple up the street have all mysteriously vanished. Sure enough, all those others have been called up to heaven, where the voice of God tells them that this is really kind of a trial run and they’re to go back to earth for three days to decide whether they really want to go live in Heaven or not. It also gives everyone a chance to try to figure out why their Christian neighbors and loved ones—the only ones who were sure that they were going to be taken up, or even believed in the Rapture in the first place—had been left behind. Roman’s opening scene gave the actors plenty to work with, but what was really interesting was how much the play really took off after the actors dropped the scripts, which happened so seamlessly that it took me a couple of minutes to realize that they’d moved on to making it up as they went along. Every run of an Un-Scripted show has a rotating pool of actors so that each performance has a different mix of people, and this show had a sharp, quick-witted ensemble. Clay Robeson gave a sensitive performance as the pastor, a gentle man haunted by having been so profoundly mistaken, and was hilarious as Fluffy, the happy-go-lucky dog who’s delighted to find that in heaven he could talk. Greg Shilling’s evangelical dad took an opposite approach to the pastor, trying to make up for being demonstrably wrong about his dogma by doubling down on it even more strictly and imposing penances upon his family, with Khoshnevisan’s high-strung mom stuck in the middle. In contrast to their Christian neighbors, Shilling and Khoshnevisan couldn’t have been sweeter as the El Sawhis, a simply living older couple just happy to be together. Joy Carletti was an appropriately moody teenage daughter as Eve—especially appropriately because she was in a situation where rebelling against her parents was totally called for. Steven Westdahl made a likeable boyfriend for her as Adam, trying to think outside the box about how to get her into heaven, and provided plenty of “awww” moments as her sweetly uncomprehending little brother. Merrill Gruver had a saucy, flamboyant air as Aunt Jezebelle and sprawled around lethargically as a pampered cat. It all came together beautifully in a tidy two hours, and was in fact one of the more fully realized plots I’ve seen in an Un-Scripted show to date. Whether that held true of the next night or the following weekend is unknown, but that’s the thrill of it. You never know quite what to expect from an Un-Scripted show. Neither do they. Show #65 of 2011, attended July 8.